A dark and sinister tale of a boy’s exploration outside the confines of his small world and into the Kafkaesque horrors of the unknown. Boy in Darkness is an episode in the Gormenghast series when Titus Groan, referred to only as “Boy”, the 77th Earl of Gormenghast longs to see what is beyond his protective prison in the garret of an ancient castle and meets the nightmarish figures that lurk and plot far from his comfortably safe bubble. It is, basically, a one man show where Gareth Murphy switches easily and quickly between each character whilst recounting the story. The stage is simple, just a 10’ by 10’ (approx.) board on the floor with the audience on three sides and a tatty wooden pallet leant against the back wall. The lighting is minimalist and the sound is all from the mouth of Murphy himself. Alone on the stage, dressed in loose fitting comfortable ‘work-out’ clothes, he begins by capturing Boy’s ennui and his desire to see more of the world. He climbs the pallet onto the back balcony and uses his parkour skills to scale the walls around the theatre behind and amongst the audience as Boy eavesdrops on other rooms in the castle and looks to the depths below with a real need to explore. When Boy meets Goat, Hyena and Lamb, Murphy’s skill in switching from one to the other is sublime and utterly convincing. One scene where Hyena is climbing with Boy over his shoulder Murphy jumps from aggressive and determined Hyena to prostrate Boy and it is beautifully choreographed. The voice that Murphy uses for Goat is disturbing and Goat’s relationship with Hyena is quite magical. Goat seems to be afraid of Hyena yet placates him with platitudes of ‘Hyena dear’ and ‘darling’. Lamb is an extraordinarily strange character who is the antithesis of the lamb of Christ and these two ideas juxtapose to create something that is truly horrific. The language itself is poetic and beautiful, though one wonders, the use of the definite article when referring to the beasts is occasional and somewhat misplaced. Are they Hyena, Goat and Lamb or The Goat, The Hyena and The Lamb? This little nuance seems trite but it does affect how one sees the beasts, as ‘The Goat’ is not as sinister as ‘Goat’. Murphy is a consummate professional not letting up for a second during his seventy minute performance even when he injures his foot and blood can be seen trickling from him. 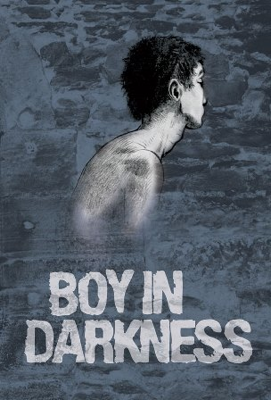 Boy in Darkness is more the narration of a story than actual theatre itself and children would love this, so if Gareth Murphy has children then they are very lucky indeed.